"Relax, I won't take your life." Jubei (獣兵衛), formerly known as Mitsuyoshi (ミツヨシ), and also known as the One-Eyed Lotus (双蓮の隻眼 Sōren no Sekigan), is one of the Six Heroes who fought in the Dark War against the Black Beast and a cat-type beastkin, being the progenitor of the Kaka. Jubei was the husband of Nine the Phantom and is the father of Kokonoe. He has taught Ragna the Bloodedge, Jin Kisaragi, and Platinum the Trinity, also being the wielder of the Nox Nyctores - Mucro Somnio: Musashi. 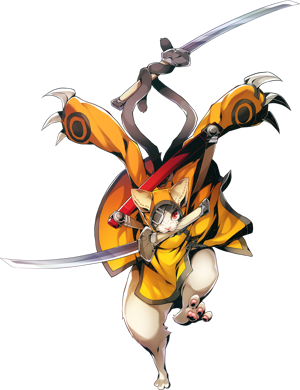 Jubei was designed by Yuuki Kato as a non-playable character for BlazBlue: Calamity Trigger. On July 16, 2017, he was revealed as a new DLC character for BlazBlue: Central Fiction at the Evo 2017 championships. He was released in Japan and North America on August 31, 2017, and released in Europe on September 4. Jubei's fur, attire, and sekkigan. Jubei is a two tailed, cat-type beastkin with black and white fur, amber eyes and a black mane, which is hidden under his hood. He wears a largely orange hoodie with black trimmings, reminiscent of those worn by the Kaka clan, with a brown belt strap that went over his right shoulder, which he uses to carry the Musashi. He also wears a belt-like eyepatch over his right eye. Underneath it is his late brother Tomonori's right eye, which was given to him by Rachel, years after he lost his original eye defending Bloodedge and Celica from a remnant of the Black Beast. During the time of the Dark War, Jubei wore a yellow hoodie which he kept open, a red forehead protector, a brown tunic held with a dark brown belt with silver kunai like tips hanging from it and a red collar with a gold buckle. While fighting the Black Beast, Jubei wore samurai-like armor, consisting of a black chestplate with a red neck guard, red and gold armored sleeves that reached down past his arms, which were fastened to the chestplate with red and gold trimmed straps and a black and red helmet with a prominent gold crest, which also had cat ears on it. Jubei's feline appearance belies his true age as a beastkin who has lived for over a century. Having seen the world before the Dark War, during it, and after it, Jubei's outlook on life is unique, and he plays the part of a mentor who has helped guide those who come to him. This role has come naturally to him as he has taught Ragna and looked after him all throughout the man's adolescence; from fighting to cooking, Jubei has done his best to fill a parental role. Cheerful in a way befitting an old man, Jubei's jovial outlook on life is infectious, and he wants nothing more than peace for his friends and family. Although his speech is generally rough, his sense of humanity is better than most humans, and it does not take much to emotionally sway him. Regardless of his status as a legendary hero, Jubei has experienced prejudice and hatred because of his species, but that has not dulled the outlook he has. Jubei makes regular trips to Lost Town to visit the Kaka and spend time with them. Regardless of those he meets, Jubei treats them with the same warmth. His relationship with Nine is the most interesting. The two have a clear love for one another that blossomed during the Dark War, even though they have found themselves at opposite sides of a conflict more than once. Jubei clearly loves his wife regardless of any conflict and the constant teasing that she puts him through, making him blush at every opportunity. Unfortunately, Jubei and Kokonoe have an estranged relationship caused by Jubei's absence in her childhood, in turn caused by the Novus Orbis Librarium hunting him immediately following the Dark War. While Jubei wants to rekindle the relationship with his daughter, she was repulsed by the idea until recently. Despite all his warmth and jovial nature, Jubei is capable of hatred, which is primarily directed at Yuuki Terumi. Terumi took everything away from Jubei, having been responsible for the deaths of his clansmen, his brother, his homeland, his wife, his comrades, and an assassination attempt on his daughter. With Nine's resurrection, Jubei believed it his duty as her husband to be the one to fight her, having to put aside his feelings for what he felt was the greater good. Even though he has the appearance of a mere house-cat, Jubei is one of the strongest creatures in the world. His physical strength is easily enough to block a punch from the muscular and towering Iron Tager with a single paw. Jubei's weapon is the Nox Nyctores - Mucro Somnio: Musashi, which are twin swords that can cut through anything. 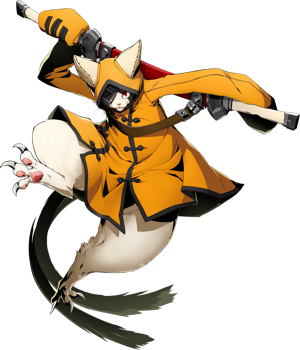 Jubei wields them with his paws, tails, and mouth, using his dexterity to pass it to the different parts of his body and fight. Using Musashi, he can cut through even magnetic fields and sorcery. Because of his beastkin heritage, Jubei has a long lifespan, and is already over 100 years old. He has a high resistance to seithr and has eyesight and hearing far beyond that of a human. Underneath his eyepatch is the Sekkigan, which allows him to see the true form of Yuuki Terumi and even materialize him. As well as all his natural abilities, Jubei is exceptionally fast, something which even shocks people like Hibiki Kohaku. He is still not as quick as his brother, Tomonori. In gameplay, Jubei's Drive is Shiranui; he launches himself quickly at the opponent, cutting them with his razor-sharp claws. Using his Distortion Drive, the Immovable Object: Lotus, Jubei acquires a new Drive, the Shiranui: Steel. This Drive allows him to move at breakneck speeds after placing a signet a short space in front of him. Other than his Drive, Jubei can also launch fire balls and counter his opponent's attacks with his own. Each of Jubei's claws, tails, and swords are at his disposable in a fight. Outside of his physical strength, Jubei has the mental strength to resist the ill effects of Musashi. He also became one of the chosen inside the Embryo, and although he suffered from memory loss, was quick to see that the world was an illusion. Despite his rough words and accent giving the impression that he is not intelligent, Jubei has a keen intellect that has not dulled with age. He is also an exceptional teacher, having trained both Ragna and Jin, two of the strongest beings in the world. Yet for all his strengths and moniker of the strongest creature alive, age has crept up on Jubei. He is not as fast nor as powerful as he was during the Dark War, which was even stated by Hakumen himself, and his reliance on close-range combat gives him difficulty fighting foes at range. His injuries, which were inflicted by Phantom's magic also permanently cripple him and weakened him further. Because Jubei is a beastkin, he struggles with the usage of Ars Magus even though he wields a Nox. Mori: It's the same for Kokonoe. Anyway, Kato sure loves cats. One of the Six Heroes, who is also known as the One-Eyed Lotus. He is a long-living beastkin, who is one of the few people to have personally experienced the Dark War. He wanders the world and has friends in every part of the globe. At one point, he took Ragna under his wing and trained him. A little uncouth, but is generous and dignified in his manner. One could say he is even more human than humans, and can be easily swayed from emotions. A beastkin warrior who fights with a katana and his razor-sharp claws. He believes in duty and humanity, and has a strong sense of justice. Under the request of his long-time friend, Clavis Alucard, he investigated Shuichiro Ayatsuki's research and findings. Many of his clan died to the Black Beast, making his hatred for the monster stronger than normal. Once one of the Six Heroes who fought during the Dark War, he is a beastkin called the "One-Eyed Lotus." Although he is rough around the edges, he is generous and has a good sense of ethics. With his own claws and the phenomenon weapon "Mucro Somnio: Musashi," his bounding attacks are fierce. With the speed of a beastkin, slash the opponent! One of the Six Heroes and Ragna's mentor. A cat-type beastkin, he possesses longevity, and according to his extraordinary strength in battle is said to be the "strongest living being on earth." The mobile game 'Mabinogi Duel stars Jubei as a playable card. In the BlazBlue 10th Anniversary Character Poll, Jubei placed 32nd out of the 84 candidates. He scored one place above Arakune and one place below Izayoi. He had 650 votes. Jubei's movelist has a naming theme around Buddhist spiritual beliefs and words. Hakumen will often call Jubei a Grimalkin in the English dub and a Bakeneko in Japanese. A grimalkin is a mythical Scottish wildcat that was believed to be a witch's familiar; this jab is likely because of his relationship with Nine. A bakeneko is a mythical Japanese cat with twin tails that are said to live far longer than humans. Jubei is the one who deals the final blow in Taokaka's Astral Heat. If Tao uses it against Jubei, however, Torakaka will deal the final blow instead. Jubei was introduced as a playable character eight years after his debut in BlazBlue: Calamity Trigger. This is the longest interval between a character's initial introduction and them becoming playable in the series. Jubei's dash will send him underneath most projectiles. Jubei's Astral Heat will show Terumi's spirit form if performed against Hazama, Susano'o or Terumi himself. In BlazBlue: Continuum Shift, Jubei is said to have cooking skills on par with 5-star restaurants. The country that produced the Kaka Clan from Jubei's genes is unknown, but it perished during the Dark War. Jubei is the eighth and last DLC character in the C-series and the third for Central Fiction after Mai Natsume and Es.